Coming Soon to the Olde Walkerville Theatre! 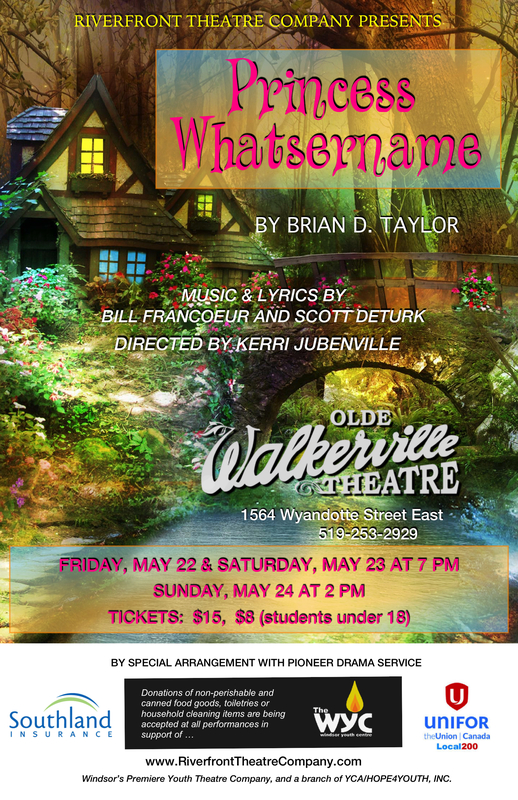 Coming May 22-24, Princess Whatsername! With a classic fairy-tale setting, loads of exciting and hilarious roles to play, a variety of entertaining musical numbers and a plot full of mystery and adventure, this show has it all! It begins in the Misty Forest, where a girl is sleeping all alone. But when she wakes, nothing looks familiar to her. She can’t remember anything — not where she’s from, how she got here or even her own name! She embarks on a journey to discover her identity and meets several fairy-tale characters along the way — Hansel and Gretel, Rumpelstiltskin, Goldilocks and the Three Bears, Snow White and the Seven Dwarves, Cinderella and Rapunzel to name a few. Some are helpful, some are dangerous and some are just plain weird, but all have information to help our young girl eventually realize her true identity as a princess. As with any good fairy tale, there’s also a prince! He’s desperate to find the princess, but he’s always one step behind and inadvertently rescues and wins the hearts of all the wrong princesses! A rocking musical score adds even more fun to new takes on the stories everyone loves. Previous: Previous post: Outrageous Fortune has ended! What’s happening NEXT?